Are you punter who fancies a golf bet? Wondering where do you find the best odds? The widest selection of matches to bet on? and great promotions? The answer is to come to Betopin! Betopin reviews gambling sites on a regular basis and publishes a toplist of the top golf betting sites. Betopin previews all of the important matches and offers tips about likely winners as well. Golf dates back to Scotland in the 15th century and the standard 18 hole round came into being at St. Andrews in 1764. There were punters betting on the matches in those days as well. One of the important features of betting on golf is that each course is physically different and different from day to day as the location of pin changes. When you bet on golf, follow the previews at Betopin for sound insights and consult the toplist for the top golf betting sites. If you want to bet on golf you will want to start with the four major tournaments. PGA Championship: various locations in the U.S., May. 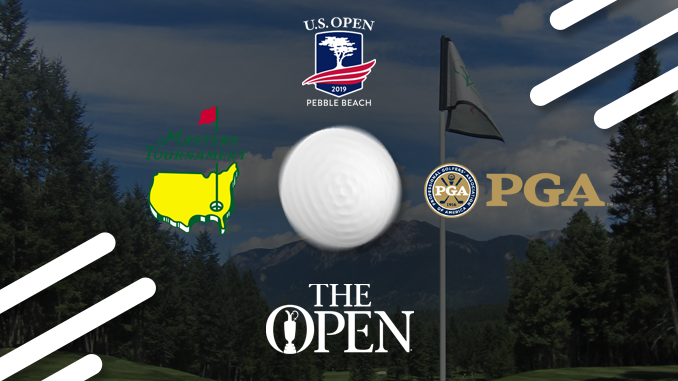 U.S. Open: Various locations in the U.S., June. The Open Championship: One of ten courses in the U.K., July. Be sure to consult the Betopin previews for insights on whom to bet on, the odds, and how the specific course, climate, and mix of professionals and amateurs may affect the outcome. And, of course, the year ends with the FedEx Cup where the top players compete for major prize money. If your interest tends toward women’s golf, the major LPGA events are these. As with men’s golf, those punters who wish to bet on the outcome of one of the major women’s tournaments should start by reading the previews on the site and then heading to one of the betting sites on the toplist. Betting on the winner in golf can provide impressive odds, even for the top players. The most heavily favoured player will typically offer 4/1 odds while other top ranking players can easily offer 100/1 odds. Obviously, anyone who is ranked far from the top of the pack will provide even more impressive odds. But, expectations can change from week to week in golf when a player enters a “hot” streak and wins or places high in a tournament or two. Thus a punter who places a bet to win at 200/1 odds on a personal favourite may be pleasantly surprised when the player in question starts winning and stands at 10/1 on the first day of the tournament. Each way betting allows punters to win if their player wins the tournament and to win a fourth of that if the player comes in fifth or sixth, depending on the betting site. First-round leader betting allows a punter to win on the effort of a player who common starts strong but cannot stand the pressure and fades in the later rounds. When this bet is combined as an each way bet with a high eventual finish it allows for wins on those who are edged out on the back nine on the fourth day. Match bets let you pick two players and win if your choice scores better. This is not as exciting as picking the winner of the tournament nor as profitable but can result in a profit and can be very enjoyable. Nationality betting can be a good choice if you are very familiar with players from one country or another. Like with match bets, the pay-outs are less but you may have much more success picking a winner! The Hole in one bet is a bit like picking a number in the lottery but a great pay-out when you choose correctly. There are various ways to bet on sports called platforms. These range from sportsbooks to betting exchanges in which punters wager one against another and the platform does not take a position takes a small amount of the winnings as a service fee. Punters can bet on winners or choose platforms that offer spread betting. And, another option is to use an exchange the offers sports trading. In a betting exchange, the punter is not betting against the bookmaker but rather against another punter. The exchange makes their money by taking a small percentage from the winnings. One unique difference between betting exchanges and other platforms is that a punter can place a “lay” bet which is a bet that a certain player will lose! In a betting exchange, you may find someone to take your bet when a sportsbook would not. And, most consider the odds set at an exchange (by thousands of other bets) to be fairer than with a sportsbook. A sportsbook like Unibet is where you can lay a wager on the golf tournament and player of your choice. While a sportsbook is basically a bookmaker this is not someone that you need to physically go to see to place a wager. Rather sportsbooks can be found online and offer varying odds and sports on which a punter may choose to bet. For the best sportsbooks for golf betting, the best odds, and the best selection of bets, take a look at our toplist. Whereas it can be difficult to predict the winner of a major golf tournament, it can be easier to predict that a certain player will finish within a certain number of strokes of the winner. Or, when placing a match bet on one player versus another, you can pick two players who will likely come in with different scores but win if your player of choice beats the spread! Picking a winner in a golf tournament can be difficult at the best of times. A player may be on a hot streak that expires just as he steps up to the tee on the first round at St. Andrews. Or, an “also ran” player may get “hot” the week before the U.S. Open. The weather may change and improve the odds of one player versus the others. For that matter remember Tiger Woods’ fantastic comeback in 2018? If you had placed a bet on Tiger with 1,000/1 odds early in the year, you could have laid off that bet at much better odds and walked away with a tidy profit later in the year. Golf sports trading allows a punter to lock in a profit by making a bet and later laying it off. He or she locks in a profit before the match even begins! This approach is similar to sports trading but the punter can both make a bet and lay off a golf bet simultaneously. If he or she picks the right bet and timing this way to bet on golf can virtually guarantee a profit. The golf season is rapidly approaching with the Masters just next month. The Masters, the first major of the year held in the most iconic golf course in the world, Agusta National. Unlike the other three majors, The Masters is played on the same course year in year out so you would think it would be one of the easiest majors of the season, but it is the total opposite. The Agusta national course is one of the most difficult courses to negotiate your way around with the famous Amen Corner standing in your way to ruin a round in the blink of an eye. Only the players who hold their nerve and do not get swallowed by the course will rise to the top and battle it out to dawn the famous green jacket on Sunday evening. With Tiger Woods a year into one of the most sensational comebacks ever, a spread bet on Tiger may not have great odds but will typically offer a pretty sure chance of winning. How will the weather be in Augusta? Will the greens be fast or slow? Just how devious have the groundskeepers been in cutting the grass short on the edges of the sand traps and water hazards? Sports trading platforms give a punter the opportunity to place a bet early when sentiment is high for the likes of Tiger and then lay off the bet when it appears that his old back ailment is causing problems again. While older players (which includes Tiger) may do well in the balmy breezes of Augusta, Georgia or on a hot summer day at the U.S. Open, they may tighten up and feel the chill off the cold air coming off the North Sea! At all times, consult the previews in Betopin and their toplist of best betting sites as the golf season comes upon us. You love the game of golf, love betting on the winners, placing spread bets, and hedging your risk by laying off bets when the odds change. All of this is possible in the world of golf betting. To make your odds better, to keep up with the news as an event comes closer, and most certainly to choose the right betting platform and site for your betting strategy, come to Betopin for the reviews, for current information and for the toplist of best golf betting sites.